This No-Bake Chocolate Chip Granola Bars recipe is made with just 6 ingredients. Chewy, super easy to make and absolutely delicious! It’s a good idea to make your own granola bars, because that way you get to control what goes into them. This recipe is made using wholesome ingredients, such as rolled oats, almonds and cocoa powder. Dark chocolate chips are also thrown into the mix for even more chocolatey flavor. A naturally-sweetened base of pureed dates and honey binds everything together. To ensure that these bars come out perfect, be sure to very firmly press the granola mixture into the baking pan with your hands, the sides of a mug or a flat dish. Then allow it to chill and harden completely before cutting into bars. These two steps will really help the granola bars to hold together when sliced. These bars are perfect for snacking, because they are perfectly portable and will keep you feeling full for a long time. Once you try these nourishing, flavorful granola bars, you will forget about buying the boxed ones for good! Food Processor – This is the one I use and love! I have had mine for years and it is one of my favorite kitchen tools. I use it all the time to quickly mix ingredients and to make sauces and dips. Mixing Bowls – This is a 3-piece set that is great for combining ingredients. The bowls nest together, so they are super easy to store. Square Baking Pan – This pan is the perfect size for this recipe. It also works beautifully for making brownies and cake. Line an 8x8-inch baking pan with parchment paper, leaving some overhang on the sides for easy removal. Set aside. In a large mixing bowl, combine the oats and cocoa powder. Stir in the almonds and chocolate chips. 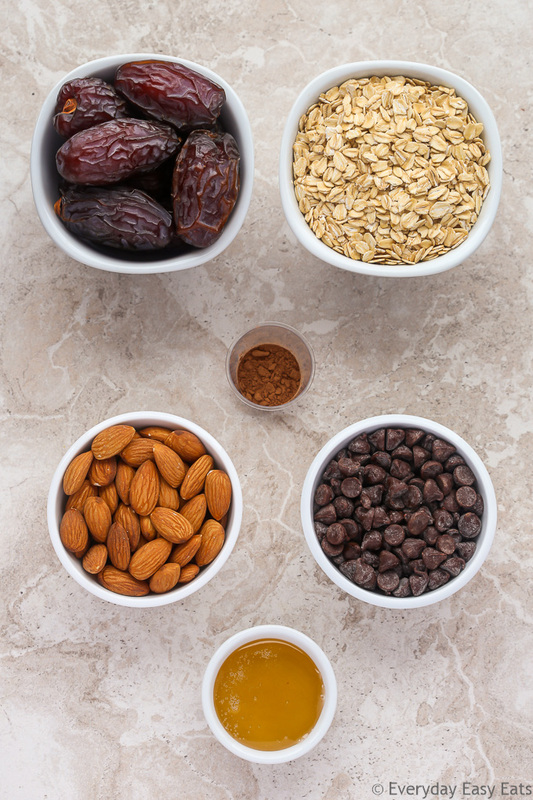 Add date mixture to oat mixture and mix, using your hands, until well combined. Transfer mixture to the prepared pan and firmly press into an even layer. Chill in freezer for about 20 minutes until firm. Remove from freezer and lift granola mixture out of pan using overhang on sides. Cut into bars and serve. To make this recipe vegan, substitute the honey with maple syrup and use vegan chocolate chips. To make this recipe gluten-free, use certified gluten-free rolled oats. 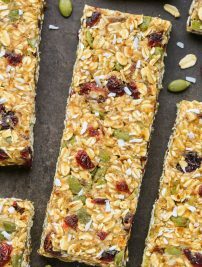 I love granola, and granola bars – these looks so much more enticing than most of the no-bake ones I’ve made – thanks for the recipe! Hi Laura! Thanks so much! ♡ I just ate one an hour ago, haha. 🙂 You’re very welcome! Any granola bars studded with chocolate are definitely my kind of bars! Loving the combo of chocolate and almonds – can’t go wrong with that!